One of my clients calls me her “wife.” She says everyone needs a wife, and with her busy schedule, I’m the one who runs her errands, does the laundry and makes some of the new recipes she wants to try out. Bonus for me: she sends me home with half of the food since her kids won’t eat things like black bean hummus. She’s lost about 20 pounds by running and eating well, with many of her recipes coming from Cooking Light Magazine. 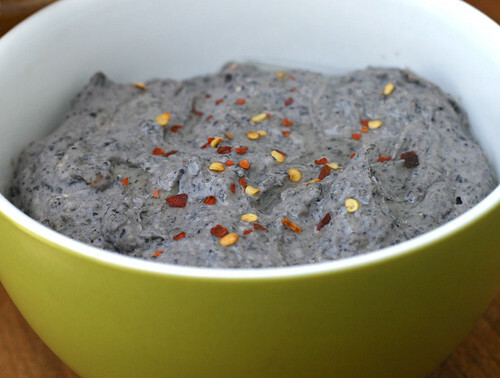 This black bean dip looked good to both of us, so I whipped it up one day and liked it so well that I copied the recipe and have served it at several dinner parties. I’ve also made it just for something to snack on from time to time. It’s been a big hit with most people, and since I have a few vegetarian friends, it’s a great addition to any party they’re attending. Please pass the Beano before consuming! Place garlic in food processor; process until finely chopped. Add lemon juice, tahini, cumin, salt, black beans, jalapeno pepper and crushed red pepper; process until smooth. Spoon bean mixture into a medium bowl and drizzle with olive oil. Sprinkle with ground red pepper. 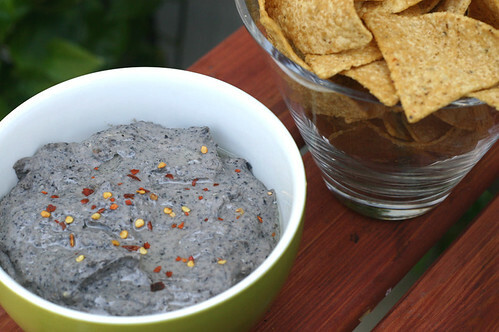 Serve with multi-grain or pita chips. Serves 8 (serving size: about 2.5 Tblsps hummus). This looks great! I’ve been on a black bean kick lately, but I didn’t make a hummus. I made this today – it’s mighty delish! It’s also great for John when he comes home from golf all famished – lots of protien and served with his favorite El Ranchero chips. Thanks for sharing! I love this – it looks absolutely delish, and it uses cheap ingredients. I am already craving this on a sandwich! Thanks for letting us know! I’m making it again because it was so damn good. Unfortunatly I’ve got to share it with company – fortunatly I like them a lot! So glad you’re all enjoying this! I’ve found I like keeping some on hand for a healthy snack when I get home from work. It goes fast. I made this AGAIN for the fourth time since you posted it. Now I’m snacking on it with zucchini coins as my “chips”.